This an update to the client-favorite Market Update “Step right up and buy a ticket to America Rebirth Ride April 12, 2012”. Do you remember the seemingly forgotten headlines only a short time ago about Congressional budget battles, possible US shut-downs, US & European sovereign debt, and the uncertainty of the US dollar’s status as the world’s reserve currency? It seems the financial press has all but forgotten these still un-resolved macro issues. Many readers may wonder how I am still advocating a dominant US exposure within portfolios. I already addressed the power of innovation in a previous article, rather this Update will continue on the American Re-birth theme I began writing about in April 2012 that could now be called America’s Rebirth: The Next Generation (live long and prosper my fellow Trekkies). Let me explain. Surveys of manufacturers continue to show many more are considering moving operations back to the US, in fact Boston Consulting Group expects this trend to increase in 2015. To get an understanding of this and what it could mean to these areas, simply look at North Dakota. While many states are wrestling with how to create jobs, North Dakota has achieved the nation’s lowest state unemployment of 3.3%. In fact many articles tout there are more jobs available in ND than residents in the state. While some argue that stat is misleading due to the small population of ND, I think they are not seeing the stat clearly. ND did not have other industries that are still hemorrhaging jobs as the economy transforms due to technological advances. So a state like PA, while benefitting from a shale boom, still is losing lots of jobs from other industries. Obviously without the shale boom jobs in PA, the state’s unemployment would be much worse. This is not just a simple effect of creating oil and gas jobs. The shale boom kick starts a cycle: lower gas prices can result in lower electricity costs which can entice businesses which means jobs which means shopping, meals, housing, higher tax revenues and so on. In December 2011, PA Economic Development Secretary C. Alan Walker said that, according to a Public Utility Commission calculation, the decrease in natural gas prices has saved Pennsylvania energy consumers $13 billion in the last two years. 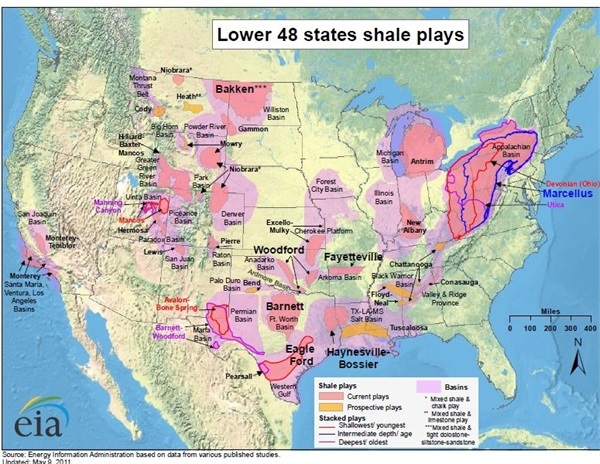 According to many articles, a large amount of the land that sits on top of the Shale formations in the map above is privately owned. 3. Wham-O brought back its production of Hula Hoops and Frisbees from China and Mexico. While the number of jobs returning to the US is still small in comparison to the number of jobs lost (approximately 650,000 of the 6 million lost according to The Reshoring Initiative (reshorenow.org) it is encouraging and steadily increasing since it began a handful of years ago. So far, the primary reason for jobs returning seems based on the rapidly shrinking difference in US and Chinese labor costs (once you factor in shipping costs). Not only are Chinese labor costs rising 17% annually but the Yuan continues to strengthen against the dollar. In addition, in the US, unlike in China, it is easy to find skilled workers in our cheapest markets. I think you will continue to see lower volume/less labor intensive products (i.e. appliances, equipment) the most likely to return to the US. Whereas high volume, labor intensive products (i.e. apparel, TV’s, trinkets) seem to me most likely to continue to shift to where the cheapest labor exists. There are many who doubt this trend will continue to grow. I would be a doubter too if that were the limit to this recent phenomenon. In addition to what I have discussed about water as an investment before, consider there are numerous white papers and published studies showing China is irreparably consuming water from its main aquifers. Manufacturers, as well as most industries, cannot operate without plentiful water supplies. The US is blessed with abundant water resources along with countries like Canada, Russia, and Brazil. Along with this, cheap electricity (a benefit of the shale boom), economic and political stability convince me that the recent return of US jobs is not just a one-trick pony of labor costs alone. In summary, remember we have not experienced a correction of 10% or more (had 12 corrections of 20% or more since 1950) for almost 3 years in the major equity indexes and I continue to believe we could experience another ‘punch to the stomach’ (approx. 15% price decline) in the markets over the next year due to one or more of the un-resolved macro issues mentioned above coming to a head but over my 25 years of experience I have found it is best to let the data direct my investments rather than suppositions or guesses. I remain very bullish for stocks for the long-term due to American Rebirth: The Next Generation influenced by a Shale energy boom in addition to the reasons I have discussed in previous Updates such as innovation, water supply, demographics, inflation & rising rates). The ideas expressed in my Market Updates are simply my opinion. No one can accurately predict future events with consistency. My decision making is always first and foremost for your benefit; prudence and perspective govern my decision making. Remember that as your financial advisor I work for you. I invite you to contact us at your convenience should you have any questions or need more information. ← Are you working with an investment advisor, broker or both?